Two RS232 serial ports, for connection to printer (in safety zone), PC or PLC. One RS232/RS485 serial port, for connection to printer (in safety zone), PC or PLC. 4 optoisolated outputs (16 in the IO versions). 2 optoisolated inputs (8 in the IO versions). Profibus interface to install in safety zone (available upon request for E-AF01 and E-BATCH1 versions). Analogue output with D/A converter at 16 bit, 0-10Vdc, 0-20mA, 4-20mA (available upon request for the IO versions). ATEX II 3D Ex tc IIIC T85°C Dc IP68 X for dust. The wide range of available software program guarantees the maximum versatility. Completely programmable printouts and fitted with alibi memory. CE-M approvable (OIML R-76 / EN 45501). Highly efficient red LED display with 6 digits 15mm high. Backlit LCD graphic 25x100mm display. Synoptic bar graph with 16 bright LEDs showing the active functions. Easy to clean STAINLESS STEEL waterproof IP68 enclosure; resistant to harsh and corrosive environments. Suitable for use on the table, column, or wall. Fitted with alibi memory, integrated on the motherboard. - Configuration, calibration, data entry and print formatting. - Complete retrieval of the saved data for quick replacement. Selection of the programme language directly in the set-up. Management of up to 4 independent scales (up to 2 for the AF03 version). Connectable with up to 16 analogue 350-Ohm (or 45 1000-Ohm) load cells. Connectable to printers and labellers with the command drivers. 3590EXT01BC3GD ATEX 3GD indicator with AF01 software. Stainless steel IP68 case, 25-key keypad, LED display and graphic LCD display. Protection degree: ATEX II 3G Ex nR IIC T6 Gc X for gases and ATEX II 3D Ex tc IIIC T85°C Dc IP68 X for dust. Fitted with manuals and conformity declaration (available in IT, EN, FR). 3590EXT01BCIO3GD ATEX 3GD indicator with AF01 software, 16 outputs and 8 inputs. Stainless steel IP68 case, 25-key keypad, LED display and backlit graphic LCD display. Protection degree: ATEX II 3G Ex nR IIC T6 Gc X for gases and ATEX II 3D Ex tc IIIC T85°C Dc IP68 X for dust. Fitted with manuals and conformity declaration (available in IT, EN, FR). 3590EXT03BC3GD ATEX 3GD indicator with AF03 software. Stainless steel IP68 case, 25-key keypad, LED display and LCD display. Protection degree: ATEX II 3G Ex nR IIC T6 Gc X for gases and ATEX II 3D Ex tc IIIC T85°C Dc IP68 X for dust. Fitted with manuals and conformity declaration (available in IT, EN, FR). 3590EXTBATCH1BC3GD ATEX 3GD indicator with BATCH1 software. Stainless steel IP68 case, 25-key keypad, LED display and graphic LCD display. Protection degree: ATEX II 3G Ex nR IIC T6 Gc X for gases and ATEX II 3D Ex tc IIIC T85°C Dc IP68 X for dust. Fitted with manuals and conformity declaration (available in IT, EN, FR). 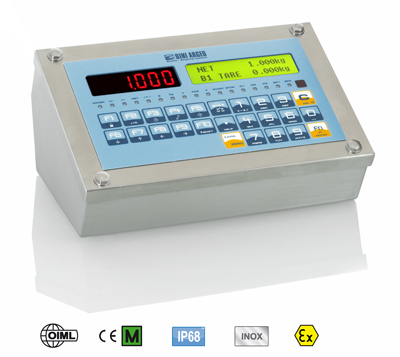 3590EXTBATCHBCIO3GD ATEX 3GD indicator with BATCH software, 16 outputs and 8 inputs. Stainless steel IP68 case, 25-key keypad, LED display and graphic LCD display. Protection degree: ATEX II 3G Ex nR IIC T6 Gc X for gases and ATEX II 3D Ex tc IIIC T85°C Dc IP68 X for dust. Fitted with manuals and conformity declaration (available in IT, EN, FR). All the cables must be installed and protected according to the standards for electrical equipment. DBM PC software for the quick compiling of the databases. For 3590Exx and CPWExx instruments. BP6ESTATEX3GD IP65 stainless steel, external ATEX battery pack, for 2 and 22 zones. For Dini Argeo ATEX 3GD instruments. ATTENTION: rechargeable in safe zone only, connectable and disconnectable from the weighing system also in hazardous area. BP6CB Battery charger for safe area, for BP6ESTATEX3GD ATEX battery. BTCB3GD Cable for BP6ESTATEX3GD battery connection. DCATEX3GD Declaration of ATEX conformity of whole. Ex II 3GD IIC T6 T115°C X system, with relative label of whole system, for Dini Argeo ATEX weight indicator connected to a mechanical structure with ATEX load cells (each cell must be certified with CCATEX option). ATEX CONFORMITY DECLARATIONS will be supplied in English. OBRF3GD-2 (S6) 868 MHz radio frequency module for ATEX 2 & 22 zones. ABS IP66 case, 3 m shielded cable, and power supply from indicator. Protection: ATEX II 3G Ex ec IIC T6 Gc X for gases and ATEX II 3D Ex tc IIIC T85°C Dc IP66 X for dust. Max. functioning distance, in appropriate environmental and installation conditions: 70m indoors, 150m outdoors. 50 configurable channels. ETHD (S1) Built-in Ethernet interface. Speed from 10 to 100 Mbps, TCP, UDP, IP, ARP, ICMP, Ethernet Mac protocols. DAC16O-1 (S1) Built-in analog output, 0-4/20 mA, 0-10VdC (cable gland excluded). For DFW, 3590 and CPW indicators. NOTE: For 3590, only with IOEXPB optional board. TAKE NOTE: this interface is not available on its own. LP542S (S1) Direct thermal labeller. LP542TT (S1) Thermal transfer or direct termal labeller. Peel-off kit in option. SMTPLUSPRO (S1) Thermal transfer or direct termal labeller. Peel-off kit in option. PRNSERV Custom-made ticket (up to 4 layouts). NET price. APRNSERV Custom-made label (up to 4 layouts). NET price. STFI-1 Stainless steel fixing bracket. For mounting the weight indicator on wall. STFR-1 Stainless steel fixing bracket with adjustable inclination. For mounting the weight indicator on wall. STFA12 Stainless steel bracket for mounting the ATEX battery on column. Compatible with "DFWBP76ATEX..", "BP6ESTATEX3GD.." and "BP6V12A". PG7EX 10 PG7 metallic cable gland set for ATEX indicators. PG9EX 10 PG9 metallic cable gland set for ATEX indicators.